The reader is reminded of that precious blood that was spilled in hatred with the turn of each page. Bold red accents adorn each page, with an occasional splatter of red drops, a visual reminder of the difficult subjects the author tackles in this thought-provoking book. 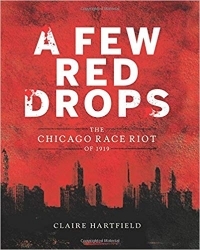 A particularly poignant read, A Few Red Drops is not only educational, but a strong reminder of our nation’s dark history in terms of racial violence—a topic we are still dealing with almost 100 years after the Chicago race riots began. Well researched and easy to read, this book is perfect for school libraries and required reading lists. The interior design of A Few Red Drops is stunning, with the inclusion of illustrations and photographs used to enhance the written text and the overall reader experience. During such a pivotal time in our nation's climate today, A Few Red Drops is hard truth look at what racial violence costs and we would do well not to let history repeat itself.